Simpson Strong-Tie’s Quik Stik rafter and truss fastening system for overhead fastening is designed to provide speedier and more accurate fastening of rafter and truss assemblies. 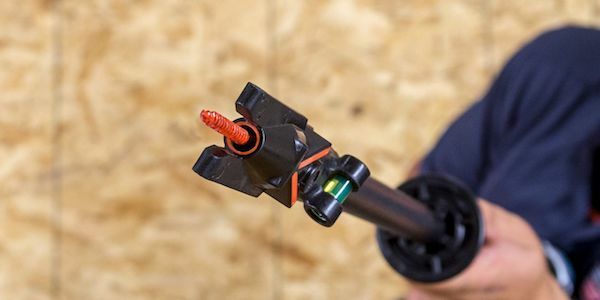 With a reach exceeding 43″, the Quik Stik installation tool was developed to eliminate the need for ladders and replace heavy pneumatic power nailers and compressor lines. Attach the Quik Stik to any corded or cordless drill or impact driver, load a Strong-Drive SDWC Truss screw into the Quik Stik head, and drive the screw. Designed specifically for use with the Strong-Drive SDWC Truss screw in rafter and truss connections, the Quik Stik efficiently fastens a variety of these installations via the narrow face of stud through the top plate; via the wide face of the stud through the top plate; and into trusses or rafters offset from the stud.